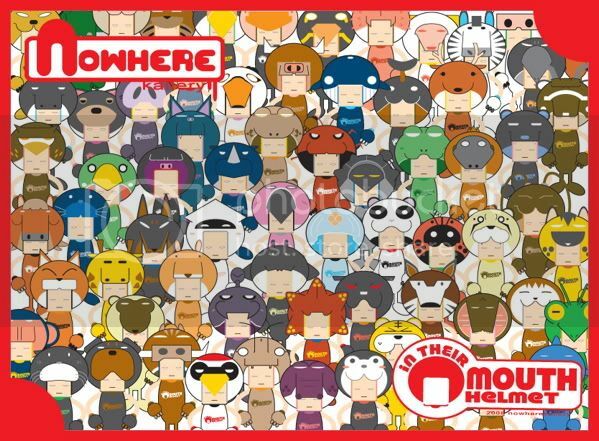 ‘In Their Mouth Helmet’, all-new 200 cartoon characters by Gio Nowhere Kallery!!! Gio Panaisit Upathumbhananda is a character designer and an underground cartoon writer. Gio published his first original cartoon book in 2004. He formed ‘Nowhere Kallery’, a group of street artist, and joined ‘Nospace First Exhibition’ at Nospace Gallery in 2007. Gio also well known as a front man of ‘Adulterer’, an indies punk band from Panda Records.